Everybody Loves Garage Sale Day! That's the little ditty we sing as we load up the van full of grubby boys and the pink one to go to garage sales on Saturday mornings. Most of the time we strike out. The sales are all duds (if we can even find them). Come one local small town garage sale hosts, post some signs with arrows for heaven's sake! You write too small for me to see your address and most of the time I don't know where your street is anyway! Grab a big ol' fat sharpie marker and just draw a stinkin' arrow! Okay, first the non clothing items. I found two twin sheet sets for the boys for a buck a piece at two separate sales (they're not matching, but then again neither are the boys!) Since I'd purchased their other ones at garage sales years ago it was time. :) I found one of those old white tupperware plates with the dividers that you feed babies from even though I think technically it's supposed to be a relish dish. It didn't have the lid, but I don't need a lid! It did have the little triangle shaped holder that screws into the center hole where you can't clean. It was a quarter. I found myself a pair of summer dressier sandals in excellent condition for a quarter. And I got an old heavy wooden tool storage thinger that I'm going to let Evan clean up and paint to display his lego creations in. Free. (And it will provide me with an afternoon's peace as he cleans and paints it and further hours of peace as he creates lego creations to put in it. Double score for me!) Also at the "free lego displayer" sale I got a cool purple travel coffee mug for a whopping $.50. Woo hoo! And it doesn't even have the name of a gas station, college or other event stamped on it, bonus. :) I also found a little pillow that Avery can have in her bed at night. I think at 17 months old she's old enough to have a pillow now, right? I can't even remember when I gave the boys pillows! On to clothes. I know. Try to hold down your excitement, would you? :) I found 5 pairs of fancy designed socks for myself. A nickel a pair. Yes, people here still price things for a nickel! I found some Disney store two piece summer pjs for myself. They have Grumpy on them. Perfect for most of my mornings :). Adding in a Gap t-shirt I walked out of that sale spending a whopping $.75 for the lot. They were each priced at $.75, but they were down to 1/2 off by the time I got there! Two other sales netted some casual stay-at-home-mom-who-wants-more-than-sweatpants-but-is-sick-of-ill-fitting-jeans pants for $.50 a piece. Are you catching a theme here? With the exception of the free wooden lego thinger I did not spend any money on the children! :) I was able to fill some gaps in my wardrobe (okay, technically I didn't NEED Grumpy jams, but hey, they were $.37 1/2 cents, give me a break) and have fun doing it! Yes, going garage sale-ing with four kids was fun! Evan tooled Avery around in her stroller (giving some of the garage sale hosts mild panic attacks, but I knew he was safe). Aidan poked around in the toys and books. Toby found a jack in the box at one sale and entertained himself and the other people there for the entire time I was there (and I took my time!). I think I like that my kids are getting older. Yes, I cherish those little kid times, but it's also great that they're getting old enough to trust to entertain themselves at a garage sale without being a total nuisance, crying, begging for junk, and screaming when I say not today. So, now I'm off to wash my finds and maybe go play legos with the boys who aren't napping today. I think they'd like that! My works for me Wednesday is a pretty simple idea. It might be totally obvious to you and if so, I thank you for your time and have a nice day. I live in MN. It's pretty warm here. We don't turn our a/c on unless we're actually melting into a little puddle. And our upstairs only has one a/c vent. And it's in the boys' room. So, sometimes when I wake up I'm sorta on the warmish side already. I also have a little coffee addiction and must have my cup o' joe to jump start my morning. Enter the problem; who wants to drink a hot cup of coffee when it's already warmish? Not me! So, I've worked out a system whereby I get my jolt of caffiene and get cooled off at the same time. Iced coffee! If McDonalds can charge upwards of $2 a cup (yes, Mom, people pay good money for cold coffee) I figured I could make it myself for less, much less! I brew my pot of coffee at night, pour it into two mason jar cups and pop it into the fridge. In the morning I splash in the flavored creamer (vanilla chai spice is the flavor of the week, but anything you like would work great), drop in a few ice cubes and hit the computer to check in on my favorite blogs! And that's it! If I forget to pre-brew the night before I brew in the morning, pop one cup in the fridge for later and put one in the freezer for 1/2 hour to chill it out quickly. They've even worked up a little "magic show"! Aidan crawls into the bag, Evan zips him in and then gives the bag commands like "roll around" "roll the other direction" and even "bag, speak!" at which point the bag giggles like a lunatic! It's quite cute and even made Grandpa smile this afternoon! What works for me today? Living with no mortgage! Sound impossible? Well, for the average American it is. However, we've found a smallish house with a smallish yard in a smallish town. And if we'd combine our assets we could pay for it in cash. No mortgage. Why is this house so affordable you may ask? Well, it's got some issues. For starters, it's got REALLY bad decorating. The living room is stark white with aqua painted quarter round on every edge of every wall, floor and ceiling as well as around the windows. And it's got a lot of windows. The carpet is in horrible shape and there's a 1x3 spot on the dining room floor where they might have started to stain it but gave up. Weird. The dining room has wallpaper boarder with neked baby angels on it. The entry to the basement is in the bathroom. The room that would be Avery's is yellow. REALLY REALLY yellow. And the kitchen? It is huge. New cabinets, flooring in good shape, nice wainscoating, a sunny window. And, um, a "skylight". That is of course to say a leaky roof. :) So, a new roof would be top on our list of repairs. All that said, if we had no mortgage payment we could TOTALLY swing this deal! In doing so, we could save a ton of money over the next couple of years, sell, make more money and buy a nice house with a big yard to raise the kidlets in! So, while it isn't possible for most Americans, living with no mortgage works for me! If you'd like to find a post of something that would really work for you try Shannon's blog. There's bound to be something there that would work for you! ***UPDATE*** Well, it turns out that living without a mortgage would have worked for us, but it seems that it's hard to buy a house that someone else has already bought. Back to the drawing board. 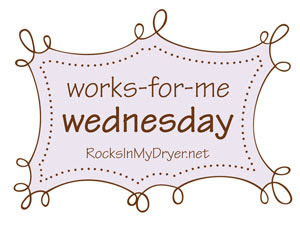 My Works For Me Wednesday post is a simple recipe that I've been making for a couple of years now. It is really easy to make, doesn't require the use of a hot stovetop or the oven (which is a bonus here right now when it's in the 80s and humid). And another bonus? It is relatively inexpensive to make, especially when compared to the storebought version. What is this cheap, easy and cool recipe? Laundry soap! Yup. Laundry soap. :) I have been making my own laundry soap for a couple of years and actually prefer it to the store bought stuff. My girlfriend Mel gave me a tub of store bought soap not too long ago when she went to a chemical free hippie version. I'm so glad to be nearly done with it so I can go back to my homemade blend! Ready for this magical potion? Here you go! Grate the soap. Gently stir the other ingredients in together. Or dump it all in a big ice cream tub, put the lid on and shake it around to mix. Use as powdered. I can make a x4 batch in about 20 minutes using a hand grater. This lasts for months and I do a couple of loads a day. If you have a food processor you can use that to do the soap, but for my money it's more work to get the thing out, put it together, wash it, dry it and put it away than it is to use the box grater I use for my cheese. Use 1 Tablespoon per load or 2 Tablespoons for a really grimy load. Yes, only 1 Tablespoon! This works in the high efficiency front loading machines. If you have some extra stinky clothes (like potty training accidents or wet towels that have sat for too long) toss 1/4 cup borax in the machine before you start it up. And there you go! A simple, non stove, non oven using recipe that will benefit your family and your budget! Works for me! We were just settling back down from having Keven here when Jim's birthday sprang up. Knowing we'd be beat, we didn't plan much. Jim invited a few people over for lunch on the fourth (which for those of you who don't know is his birthday). I invited a few people over for lunch on the fourth. One of those people happened to be his best good friend Bubba who lives in the Chicago area! It was a total and complete surprise for Jim. He and I were sitting in the living room at 11:20 pm on Thursday night just chatting when we heard the door open and shut followed by heavy footsteps on the kitchen floor. I knew what was going on, but Jim's life flashed before his eyes as he was certain we were going to die right there in the living room! Once he recovered from the utter shock of seeing Bubba in his kitchen we had a great weekend. I'm sure there are many other things to report from the past week of non-blogging, but my heart is more than heavy tonight. We know of a young woman named Christine. Late last fall she got pregnant under less than ideal circumstances. She nobly chose to give her baby son life and put him up for adoption. Last Thursday night she went in to be induced because the baby wasn't growing like he was supposed to. She labored for 24 hours without progressing and was sent home. When she returned to the hospital the next day the baby did not have a heartbeat. Friends and strangers who read my blog, please be in prayer for this young woman. She has gone through so much to give this child life and to give another family a chance at a son only to lose him in the end. We know that this baby boy is safe in the arms of Jesus, and our prayer is that his brief time on this earth will point those who love him to Christ.